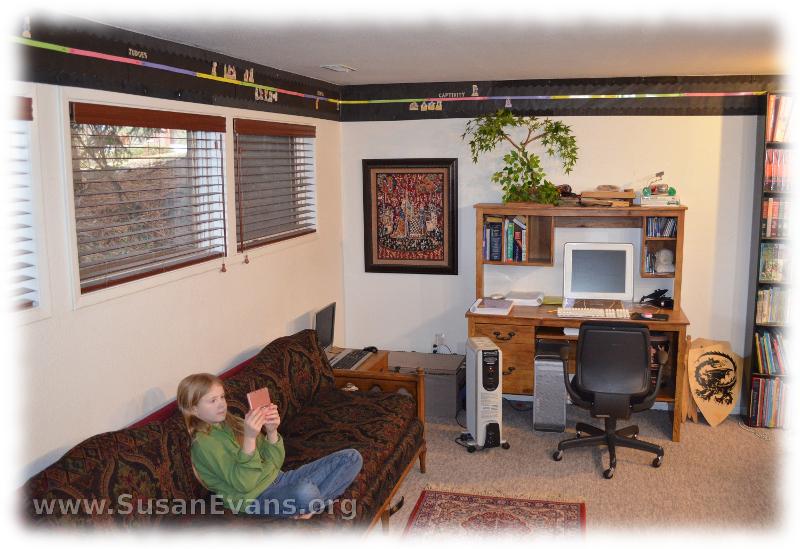 I was asked to be a panelist for an upcoming Google+ Hangout: History Timelines for Homeschool. (The show airs live Tuesday, January 14th, 2014, at 2pm Central time.) I thought I would snap a picture of my main timeline downsairs that I’ve used over the years. On the hangout I will also be showing an accordion-style timeline that I’m using for our Bible Notebooks this year. I will also show a timeline from our Ancient History notebook, which is not accordion style; the figures were glued to black card stock paper punched by a 3-ring hole punch. These two timelines are perfect alrernatives if you do not have the wall space for a timeline. For this article, I will focus on wall timelines, which are my favorite. What can you gain by displaying a timeline in your home, and adding figures as you study them in history? Your children will begin to gain perspective on time. You can step back and see how all the pieces fit together. You can map out in your mind, for example, that certain events occurred before Christ, and other events occurred after Christ. You can begin to conceptualize the rise and fall of empires and nations. You will be able to talk more intelligently about history. You have something in your mind on which you can hang events. Use black paper as a background for your timeline. I have a definite opinion of how wall timelines should be done to make them look great, like a natural and elegant part of your home. Use black paper as a background for your timeline. Black is elegant and beautiful and causes everything else on it to pop. That’s why, when you wear a beautiful necklace, you usually will wear a black dress to showcase the jewelry. It’s the same way with timelines. The great thing about black is that you can make anything look good. Even if all you have is young children who scribble outside the lines, if you cut out their artwork and put it on black, it will look fabulous. Border the paper with black teacher bulletin board trim. This will cause the timeline to disappear into the wall, and your attention is not drawn to it. There are no rough edges on the top or bottom paper if it’s bordered. It also looks polished and finished as a display. I use staples to put the trim up, but you can use sticky tack. Black flat thumb tacks would work also, because they would be camouflaged into the timeline. I like to circle a large room once, along the top of the wall. The only drawback of having it so high up is that your kids can’t see it as closely. Instead, it causes them to step back and have perspective on time, which is the whole point of having a timeline.So for me, it works better to have it along the top of the wall, where the rest of the room can have regular home decor. The room looks like a home instead of a classroom. Besides, they’ve already seen each figure up close as you study that person or event, and all they need is a small visual reminder of how that figure fits in to the rest of history. I hope you enjoyed my tips on how to make timelines look fabulous on your wall. More fun ideas for using timelines for homeschool will be covered in the Bright Ideas Press Google + Hangout tomorrow, January 14th, 2014, at 2pm Central time. Join us! This entry was posted on Monday, January 13th, 2014 at 8:00 am	and is filed under History. You can follow any responses to this entry through the RSS 2.0 feed. You can skip to the end and leave a response. Pinging is currently not allowed. I love that you showcased the timeline in black. It really does pop. I’m going to have to try that this coming school year. Black is always sleek and elegant! I am a huge advocate in aesthetics when teaching, learning, and/or playing. It has to look appealing to keep our eye and attention. Good work! We have bridged into timelines yet (Grade 1 student) but I might start one anyway. This is the most appealing way to display a timeline. I’ve seen lots of different ways to do it, and this is the most elegant. Will watch patiently. We tried doing some timeline things but it didn’t work. It needs a lot of patience. You raise my motivation. Thank you for sharing. If you only do one figure each day, it’s not overwhelming.